It’s finally starting to truly cool down in my city, and not just during the mornings. I think many of us know the struggle of it being cold in the morning, so you put on a sweater, and then by the afternoon you’re sweating and wanting to rip all of your clothes off. Anyway, my blog today is all about my favorite fall colors. Some new, some older. All favorites. Warning: some colors look the same, but are just different enough to me. I wear mostly grays and reds…all year. The main difference between fall and summer colors (for me) is that fall colors are a bit darker. That’s just how it is, right? We will go with that. I don’t have too many to talk about, and there’s only two brands! 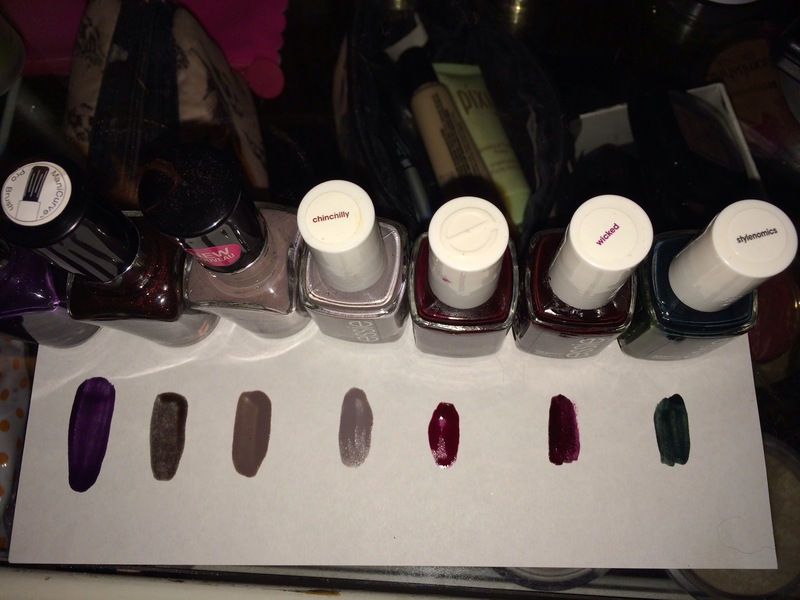 I mostly use either Essie or wet n wild. Why? They’re easy for me to work with and their colors are always amazing and last on my nails. 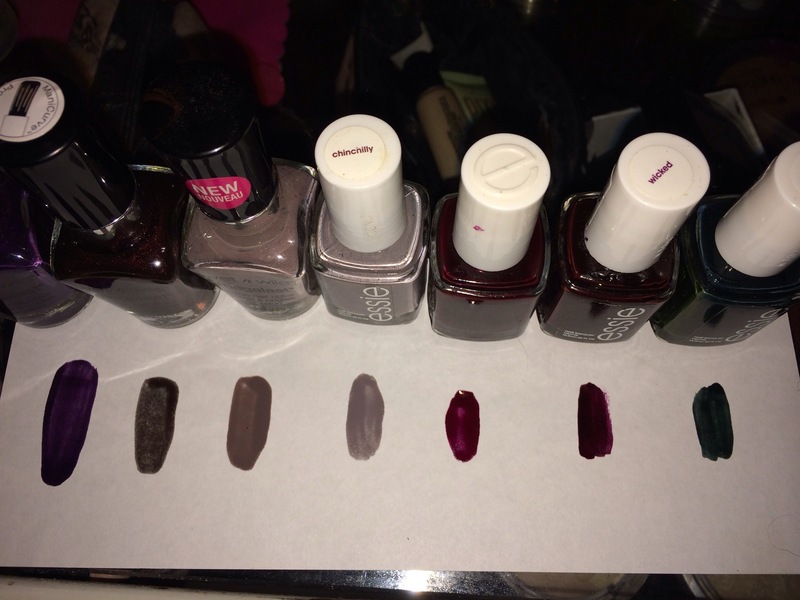 I’m not a huge nail polish collector, so I tend to stick with my favorite brands no matter what. This is what each swatch looks like without flash. Wet n wild “Disturbia” I want to say this is a new color, but I’m not entirely sure. It’s a beautiful deep purple color though. Wet n wild “Under Your Spell” this color is a bit hard to swatch because the swatch is not it’s true color. It’s a very brown toned red with a hint of glitter in it. This color requires some building, but it’s gorgeous after about 3 coats or so. Wet n wild “Wet Cement” a darker gray color. I love this color, but even more so I love wet and wild nail polishes. The brushes from this line are so wide and easy to work with while applying. The price is also amazing given the quality ($1.99 on average). Essie “Chinchilly” this is an older color, but it’s been a favorite of mine for awhile now. I actually wear it all year. I think a few other bloggers have talked about this color, but rightfully so. It’s a very neutral and light gray that goes with every fall outfit. I actually need to purchase a new one because this bottle is getting old and it’s getting hard to get polish on the brush. Essie “Skirting the Issue” a very dark, but ox blood, shade of red. A bit more Boudreaux? Either way, this is a must for fall nail polishes, in my opinion. It’s dark without being too “vampy” for those that don’t like the super dark looks. Essie “Wicked” probably my all time favorite color of nail polish. Ever. It’s a true ox blood red and looks almost black. It’s so gorgeous. I am in need of a new bottle because I’ve seriously almost used all of it. Essie “Stylenomics” this could be more of a holiday color? I don’t know, but it is a favorite of mine this time of the year. It’s a very deep green color. The only shade of green nail polish that I own, honestly. It’s so beautiful on the nails, and probably would pair well with all of the holiday looks coming up soon. These are a couple of pictures of the swatches with flash, since without flash it’s a bit difficult to tell what the true colors are. 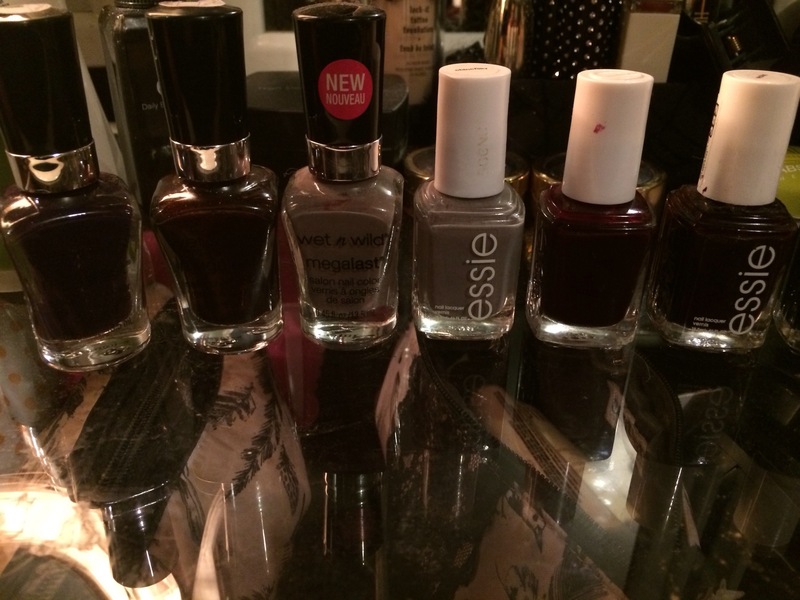 The nail polishes I’ve talked about today are just a few of my favorites. 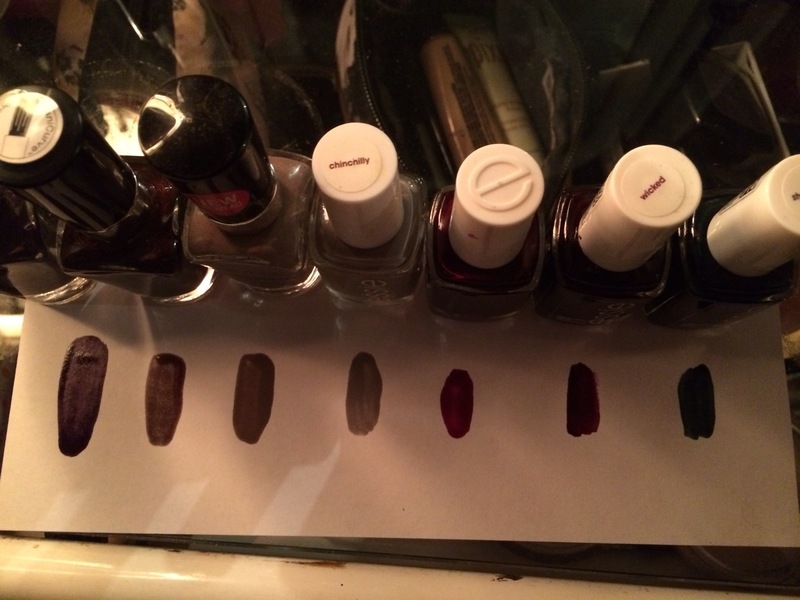 What are some of your favorite fall nail polishes? Any brands that you can’t live without that I should try? ← First impression: more ColourPop!